Apart from the wonderful texture, I love the soft pastel colors of the paisley pattern and the contrast of the stronger colors that form the border, they remind me of spice markets in India. The Hermes gift ribbon (bolduc) divides the border from the pain part of the shawl, providing a perfect frame and wonderful structure. The Damier is even more exquisite in real life. You're not the only one who wishes it would be offered again. Why I did not buy one at the same time is beyond me. that and the magic scarf! well at least I can enjoy them through your lovely photos!! FINALLY got the vert anis kelly wallet! mon ami picked it up for me while on a biz trip to NYC. yay me! You look fabulous in these shades. dogbiskit, never mind the Damier and the Magic scarf, you have finally found your HG Kelly Wallet!! Yay to that and many congratulations!!! ahh, that's exactly the kind of style and colour I was looking for in my first GM. But then DH surprised me with the PdV this Christmas, which is rather colourful, so I'll have to postpone a second one until I find something as beautiful as this. You look stunningly chic, as always! I've followed your blog for quite some time now and I just wanted to say how lovely it is. 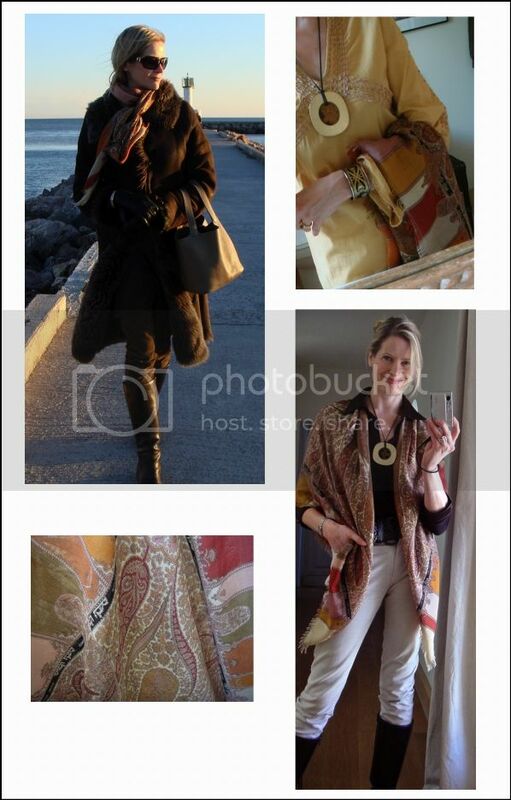 You have such great style and I enjoy seeing how you wear your Hermes pieces. Lulu, thank you so much, I am touched by the lovely compliment and am really happy that you enjoy it here! This is the loveliest of the damier shawls. Beautiful pattern and colors! Have you indulged in anything from the new season's collection yet?? I haven't been able to get through the snow to my nearest boutique yet so would interested to learn about your view of the collection and any favourites?? MaiTai - Stunning! And the scarf is glorious too! What a lovely CW. Hi Sidibirani, I have not had much chance either to check on the incoming SS2010 stock. From what I've seen so far, I love the look (and feel) of the 140 Dip Dye (will have to investigate further how much it creases), and love the Brides de Rebelles 90 Carré and Mousseline shawl. The Kelly en Perles is seriously tempting, but I'm not too keen to add another 70 size at the moment. It will come out as a Silky City bag, which would be great fun way, as it would show the design beautifully. There are still a lot of SS scarves that I look forward to seeing IRL, and I will hopefully be able to report back soon. Hope the snow will melt and allow you to check them out soon! Are you sure you're not already a member w your passion, encouragement and generosity which is so much a part of your "joie de vivre"? 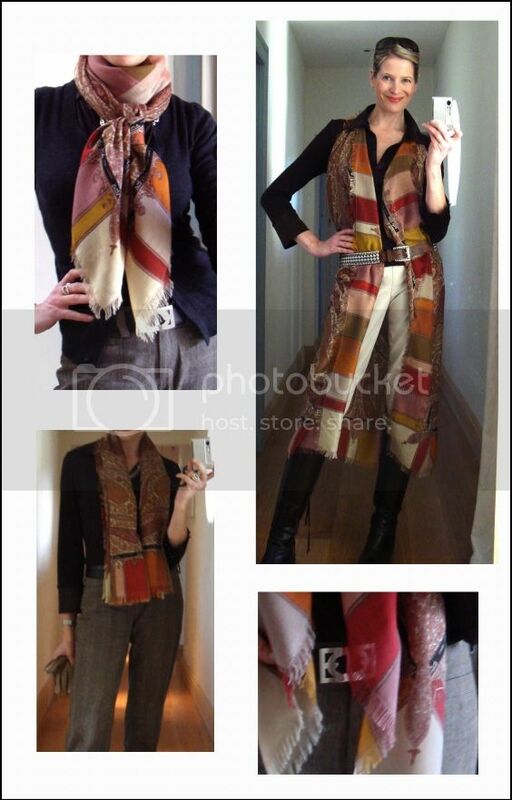 Dear Mai Tai - Would a scarf ring w an insignia be a possability? jeszica here!! You look absolutely STUNNING!! So chic! Hi jeszica, how lovely to see you here!!! I really loved your blog, but with the fur I will no longer follow. Please think about it.